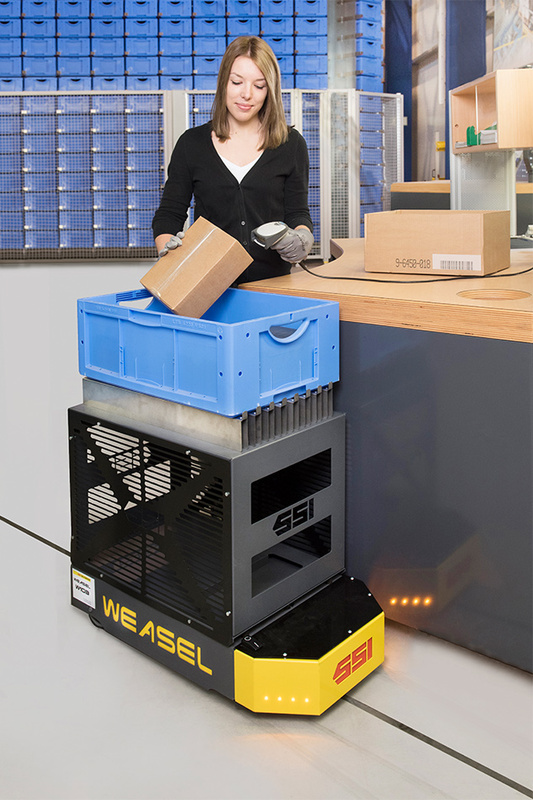 What is WEASEL® Automated Guided Vehicle? The Weasel® can transport boxes, totes or a variety of other goods through your premises flexibly and easily without a conventional conveying system. It masters almost all transport tasks – goods are transported to the intended destination safely and without access restrictions. 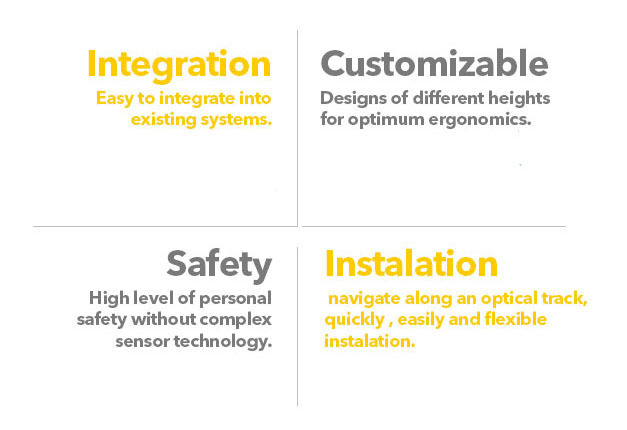 What's more, this is achieved with low purchase and operating costs. 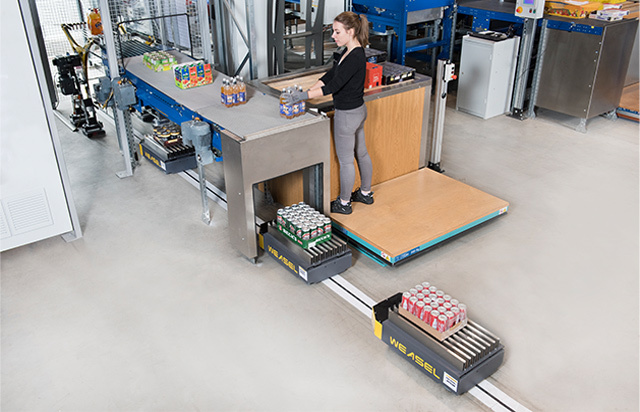 The automated guided vehicles navigate along an optical track that can be installed quickly,easily and in a flexible manner. 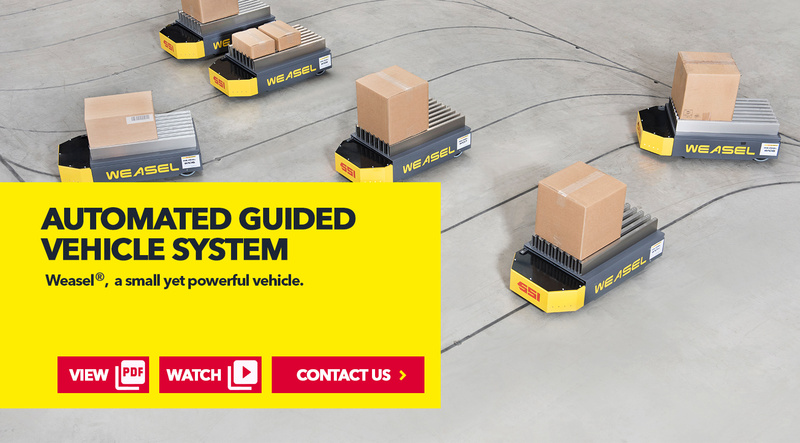 With the Weasel automated guided vehicle (AGV), SSI Schaefer offers an innovative solution that is equally impressive in terms of its flexibility and scalability. Changing customer requirements and fluctuations in demand can be managed at any time, both cost-effectively and at short notice. Standardized control software permits use regardless of the customer – there is no need for any complex installation and customization work. As a result, short-term scaling of the system presents no problems. The transport orders are generated by your in-house material flow system. A fleet controller manages the orders and assigns them to the relevant vehicles following release. The Weasel vehicles are equipped with a control system that executes the orders based on specified way points. By deploying small vehicles, even inaccessible zones can be put to good use. 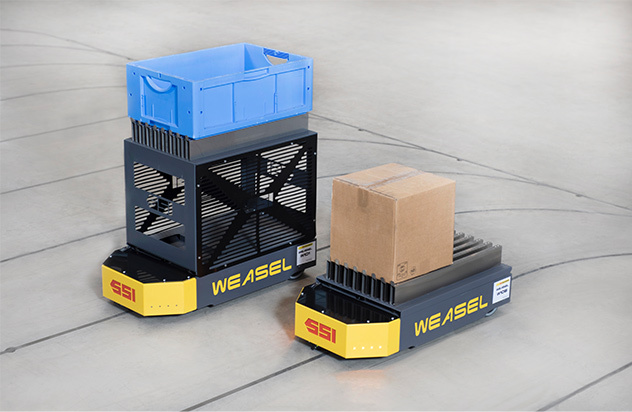 The Weasel transports bins, boxes or small parts of varying dimensions, and can be combined with a conventional conveying system. Special handling systems are used to load the Weasel and then deposit its cargo via docking rails back onto the conveying system. 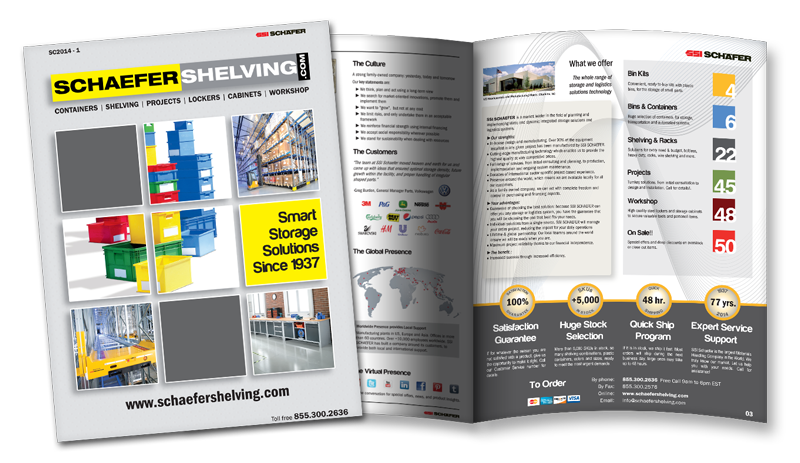 Specs, SSI SCHAEFER WEASEL® Automated Guided Vehicle in action! 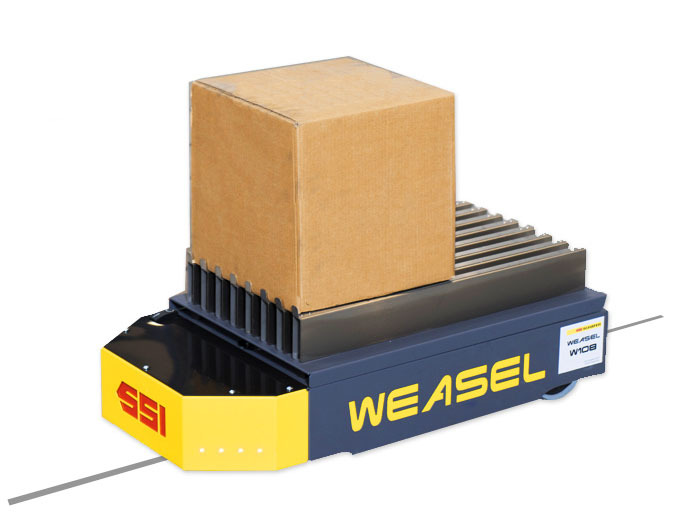 Watch SSI SCHAEFER WEASEL® AGV in action! 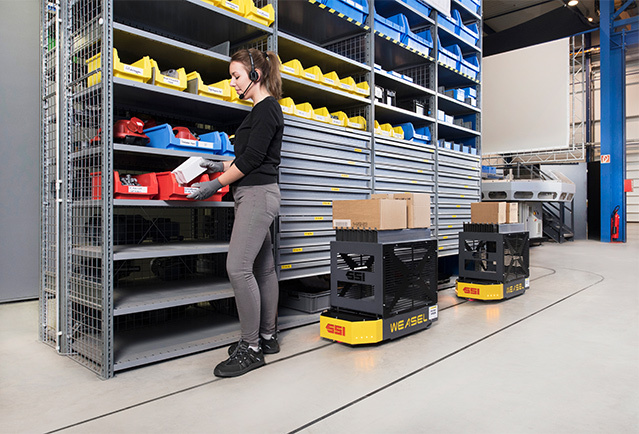 Hermes Fulfilment GmbH, provider of international full-service e-commerce solutions, is tackling new challenges using the AGV WEASEL®. A flexible link has been generated between various areas with no access restrictions. The innovative fleet solution can grow with the company and provides automated goods transport, optimization of processes and a high degree of flexibility.